HEAVY DISTORTION HD-300Heavy Metal Distortion Effects PedalPushes distortion to the extreme by producing crushing, bottom-heavy distortion for modern metal and hard rockThis BEHRINGER product has been designed to compete head to head with leading products on the marketDual distortion with gain boost..
ULTRA METAL UM300 Heavy Metal Distortion Effects PedalTake off with the most extreme and sought-after hard rock or heavy metal distortionThis BEHRINGER product has been designed to compete head to head with leading products on the marketMulti-gain circuitry to give you super-thick, tube-like distort..
DIGITAL MULTI-FX FX600 Digital Stereo Multi-Effects PedalUltimate digital multi-effects pedal comparable to state-of-the-art studio processors24-bit high-resolution stereo effects including Flanger, Chorus, Phaser, Delay, Tremolo and Pitch Shifter2 additional parameter controls to adjust delay time,..
GRAPHIC EQUALIZER EQ700 Ultimate 7-Band Graphic EqualizerShape your sound and eliminate feedback with 7 bands of equalizationThis BEHRINGER product has been designed to compete head to head with leading products on the marketWide frequency range from 100 Hz to 6.4 kHz with a powerful 15 dB boost/cut..
BASS GRAPHIC EQUALIZER BEQ700 Ultimate 7-Band Graphic EqualizerShape your sound and eliminate feedback with 7 bands of equalizationThis BEHRINGER product has been designed to compete head to head with leading products on the marketWide frequency range from 50 Hz to 10 kHz with a powerful 15 dB boost..
Kirlin Audio DI 201 FXCongratulations for purchasing the DI-201FX 2-Channel ActiveDirect Inject Box. This unit is the ultimate, multi-functional active DI box. The DI-201FX has been optimized to produce maximum headroom and dynamics while working within the limited current provided by phantom power(..
Congratulations for purchasing the DI-101FX 1-Channel ActiveDirect Inject Box. This unit is the ultimate, multi-functional active DI box. 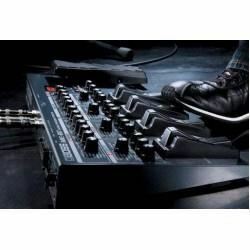 The DI-101FX has been optimized to produce maximum headroom and dynamics while working within the limited current provided by phantom power(48V).Simultaneous dual..
Korg Pitchblack mini blackKorg's Pitchblack pedal tuners have earned the trust of guitarists and bassists worldwide for their quality, design and durability. The Pitchblack mini is the latest addition to the renowned tuner series, now available in a smaller, sleek size. The Pitchblack mini appe..
Vox Av15 Analog Valve AmplifierDesigned for use at home or in the studio, the AV15 is a fully-featured analog amp that packs decades worth of tones into a compact package. The AV15’s tube-based, multi-circuit analog pre-amp provides a full complement of clean, crunch, overdrive, and high gain tones ..
Vox StompLab IG SL1G + KA189 Guitar Multi EffecThe VOX StompLab 1G is a multi-effects pedal, featuring VOX's VT+ amp modelling technology and effects. The VOX StompLab 1G is a breath of fresh air in the multi-effects pedal market, offering a simple user interface as easily approachable for beginners..
Line6 Helix LT Multi EffectThe Helix® LT guitar processor delivers the highest levels of performance, flexibility, and control in its class. Featuring the same powerful dual-DSP processing and award-winning HX Modeling technology found in the flagship Helix Floor and Helix Rack guitar processors, it..
Vox MINI3 G2 3-watt 1x5..
Line 6 AMPLIFi TT Guitar Effects ProcessorFeatures70+ guitar amps, 100+ effects and 20+ speaker cabinetsUp to 8 simultaneous effectsBluetooth streaming audio (works with Android, iOS, Mac®, PC)Access 4 tones from the front panel, plus tap tempo and tunerWirelessly control every detail of your guitar..
Line 6 AMPLIFi FX100 Guitar Multi EffectsFeatures8 simultaneous effectsOver 200 amps, effects and speaker cabinetsAccess 100 onboard presets—and unlimited presets via AMPLIFi appChange presets and switch banks using 4 pro-quality, backlit footswitchesBluetooth streaming audio for playing along with ..
Line 6 M9 Stompbox ModelerAll-in One Stompbox SolutionM9 Stompbox Modeler is powerful, portable and bursting with immortal stompbox effects. Its wide variety of vintage and modern tones makes it perfect on its own or an unrivalled addition to your pedal board. Sink your teeth into over 100 dist..
Line 6 M13 Stompbox ModelerTotal Stombox ExperienceFBV MkII foot controller connectivityM13 Stompbox Modeler is the essential all-in-one pedal board experience. It features a comprehensive collection of stompbox effects, a full-featured looper and inspiring flexibility. Free of complicated menus or ..